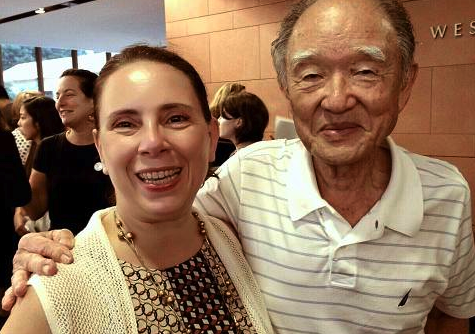 Dr. Gloria Montebruno Saller with atomic bomb survivor Junji Sarashina. The American Society of Hiroshima-Nagasaki A-Bomb Survivors, Japanese American Cultural and Community Center, and Koyasan Buddhist Temple invite the public to attend their annual commemoration service marking the bombings of Hiroshima and Nagasaki on Sunday, Aug. 7, from 2 to 4 p.m. at the temple, 342 First St. in Little Tokyo. It has been 71 years since atomic bombs were detonated over Hiroshima and Nagasaki on Aug. 6 and 9, 1945. By the end of the year, it is estimated that nearly 200,000 people died from the bomb blast and radiation-related illnesses. Hundreds of thousands more suffered unimaginable afflictions, both physically and emotionally. The purpose of the service is to remember those who passed away and support those who survived the atomic bombings. The guest speaker is Dr. Gloria Montebruno Saller, assistant professor of modern languages at the University of La Verne. She is deeply involved in promoting Japanese culture and world peace. Each year, she takes a group of university students to Japan, including Hiroshima, so that they can experience the history and the culture first-hand. Koyasan is home to the Hiroshima Peace Flame, which was ignited from the Peace Flame that burns in Hiroshima Peace Memorial Park. The flame is a reminder of the horrible events that occurred 71 years ago and will continue to burn until the world is free of nuclear weapons. For more information, call (213) 624-1267.